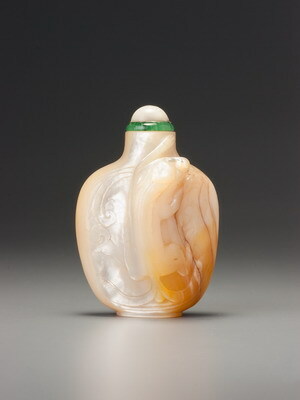 With unmarked early moulded porcelain snuff bottles, it is difficult to draw a line between those produced in the last decade of the Qianlong reign and those produced in the first decade of the Jiaqing. We know from the reign-marked Treasury 6, no. 1202, that this design was made in the Jiaqing period, but although the design is the same, this piece and that come from different moulds. The two bottles are so close in detail that it took a while to establish that they were from different moulds; obviously, one was based on the other, or both on a common original. The fact that one version of a design is from the Jiaqing reign does not preclude another from the late Qianlong. Our dating of the present article reflects this possibility, but we suspect that it is more likely to date from the Jiaqing reign. 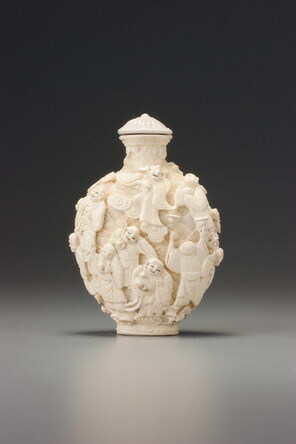 The suggested imperial attribution is again based on the belief, expressed under Sale 2, lot 79, that moulded porcelain snuff bottles in the mid-Qing period were a court-fuelled art form, and those of high quality made in reasonably large series were probably made at the imperial kilns, whether marked or not. Luohan (the term is the standard abbreviated Chinese transcription of the Sanskrit arhat) are disciples of Buddha who have transcended the cycle of birth, death, and rebirth and are honoured by all beings in heaven and on earth. Their numbers can run into the thousands, but certain groups became established over the centuries, including a group of five hundred of Hindu origin. A standard group of eighteen was well established by the Qing dynasty for depiction in art. Although many are identifiable by their physical attributes or associated animals, various sets showing the same arhat with different attributes over the centuries make accurate identification of each individual extremely difficult. For one set of illustrations identifying them all, see Williams 1932, pp. 161–168, but other, conflicting series exist. Arhats are considered fitting symbols of longevity, since they were thought to have the power of extending their lives interminably. Moulded porcelain bottles appear to have been provided from the outset with matching stoppers, usually decorated in the same colour(s) as the bottles. Many of these original stoppers have survived on the correct bottles, so we know exactly what they look like, making it possible to fashion replacements for bottles that have lost their originals. John Charlton, restorer for Sydney Moss and then Hugh Moss from the 1960s to early 1970s, made dozens in different colours. Many of these are now scattered among the world’s collections; this is one of them. The colour of the glaze does not match completely, since the stopper was not made for this particular bottle, but it is of the correct type and close in colour.